Coming to America with Wayna and Friends is a radio show and podcast featuring spirited discussions with a cast of African, Caribbean, and African American co-hosts and artists in the District. Through conversation sparked by recurring segments: Comic Relief, Diaspora Dilemmas, real life challenges, success stories and more. The cast will discuss a range of social and cultural issues relevant to the African, Caribbean, and African American experience in DC. The program’s goal is to foster mutual awareness and appreciation among these growing and diverse groups, who despite their cultural differences, share vastly common challenges, aspirations, and values. The hosts of Coming to America with Wayna and Friends are Ethiopian-American, GRAMMY nominated artist Wayna, Barbadian/African-American and Peabody award-winning hip-hop artists Asheru, and Sierra Leonian-American attorney, journalist, and blogger, JJ Ghatt, and Live DJ & Music Suupervisor Roddy Rod who is married to a Dominican-American. 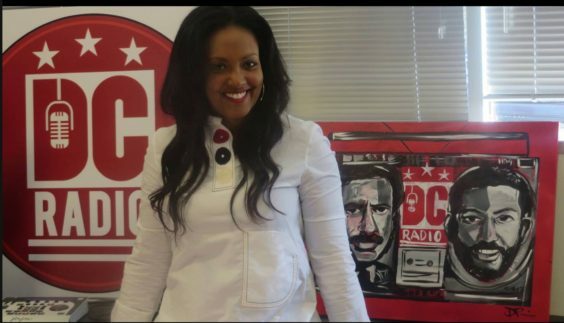 Wayna is an GRAMMY-nominated singer and songwriter who was born in Ethiopia and raised in the suburbs of Washington, DC. She worked as a writer for the Clinton White House before releasing three solo albums, garnering two Billboard-charting singles and a GRAMMY nomination for Best Urban Alternative Performance. She recently toured for two years as a vocalist with musical icon, Stevie Wonder. Wayna is married to a Trinidadian-American and is the mother of two. Learn more about Wayna. Gabriel “Asheru” Benn is a Peabody Award winning hip-hop artist, educational consultant, and youth activist. He is widely known for performing the opening and closing themes for the popular TV series, The Boondocks, as well as his pioneering and innovative efforts to forward the hip-hop education movement. Asheru is of Barbadian and African-American descent; he is married to a native Ethiopian, and together they have four children. Learn more about Asheru. Jeneba “JJ” Ghatt is a blogger, who calls herself a social media butterfly and recovering attorney. She got started at the esteemed University of Maryland College of Journalism as a student journalist, interned at US News & World Events, and created web content for the school at the dawn of the Internet before going to law school and winning landmark telecom civil rights cases for national nonprofits at the FCC, FTC, Federal Courts & US Supreme Court. JJ is married to a Trinidadian-American and is the mother of three. Learn more about JJ. Live DJ & Music Supervisor, Roddy Rod is a producer & DJ based in the DMV by way of Massachusetts. In the early 90’s his group, Maspyke, comprised of members Tableek and Hanif Jamiyl released their debut album “The Blackout” to much critical acclaim. They followed up in 2005 with the release of “Static”, on ABB Records. Roddy Rod has produced for such acclaimed artists such as Q-Tip (“Lyricists Lounge”) Doug E. Fresh, Planet Asia, and Jazz Guitarist, Ronny Jordan. He is married to a Dominican-American and is the father of three. Learn more about Roddy.